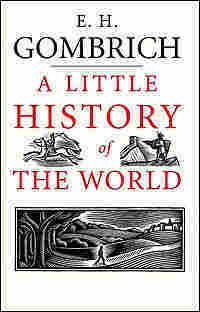 A Worldly 'History,' Now in English Sir Ernst Gombrich wrote A Little History of the World in 1936, in German. The book for young readers was translated into 17 languages. 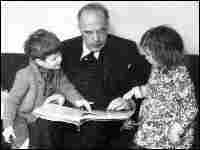 Late in life, Gombrich began an English version. That edition is being published this fall by Yale University Press. The late Sir Ernst Gombrich wrote A Little History of the World in 1936, in German. The book tells the story of human kind from the stone age to the atomic bomb and has been translated into 17 languages. A more popular work for young people, The Story of Art, was published in 1950 and sold 6 million copies for the author. 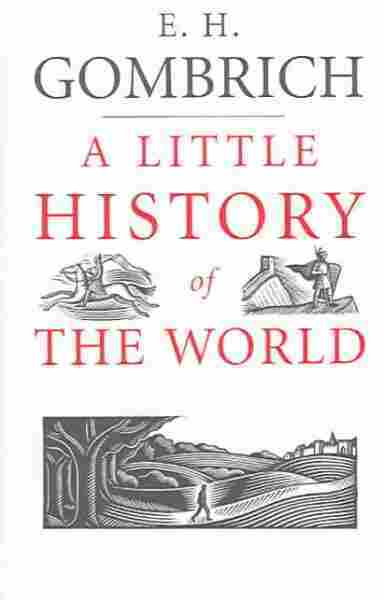 Yet for many years, Little History was not translated into English. Then, before Gombrich died in 2001 -- at the age of 92 -- he began to update and translate the original. This fall, the first English edition of the book was published by Yale University Press. Leonie Gombrich, granddaughter of the author, wrote an introduction to the new edition. She tells Liane Hansen more about her grandfather and his books. All stories begin with 'Once upon a time.' And that's just what this story is all about: what happened, once upon a time. Once you were so small that, even standing on tiptoes, you could barely reach your mother's hand. Do you remember? Your own history might begin like this: 'Once upon a time there was a small boy' -- or a small girl -- 'and that small boy was me.' But before that you were a baby in a cradle. You won't remember that, but you know it’s true. Your father and mother were also small once, and so was your grandfather, and your grandmother, a much longer time ago, but you know that too. After all, we say: 'They are old.' But they too had grandfathers and grandmothers, and they, too, could say: 'Once upon a time'. And so it goes on, further and further back. Behind every 'Once upon a time' there is always another. Have you ever tried standing between two mirrors? You should. You will see a great long line of shiny mirrors, each one smaller than the one before, stretching away into the distance, getting fainter and fainter, so that you never see the last. But even when you can't see them any more, the mirrors still go on. They are there, and you know it. And that's how it is with 'Once upon a time'. We can’t see where it ends. Grandfather's grandfather's grandfather's grandfather... it makes your head spin. But say it again, slowly, and in the end you'll be able to imagine it. Then add one more. That gets us quickly back into the past, and from there into the distant past. But you will never reach the beginning, because behind every beginning there’s always another 'Once upon a time'. It's like a bottomless well. Does all this looking down make you dizzy? It does me. So let's light a scrap of paper, and drop it down into that well. It will fall slowly, deeper and deeper. And as it burns it will light up the sides of the well. Can you see it? It's going down and down. Now it's so far down it's like a tiny star in the dark depths. It's getting smaller and smaller... and now it's gone. Our memory is like that burning scrap of paper. We use it to light up the past. First of all our own, and then we ask old people to tell us what they remember. After that we look for letters written by people who are already dead. And in this way we light our way back. There are buildings that are just for storing old scraps of paper that people once wrote on -- they are called archives. In them you can find letters written hundreds of years ago. In an archive, I once found a letter which just said: 'Dear Mummy, Yesterday we ate some lovely truffles, love from William.' William was a little Italian prince who lived four hundred years ago. Truffles are a special sort of mushroom. But we only catch glimpses, because our light is now falling faster and faster: a thousand years... five thousand years... ten thousand years. Even in those days there were children who liked good things to eat. But they couldn't yet write letters. Twenty thousand... fifty thousand... and even then people said, as we do, 'Once upon a time'. Now our memory-light is getting very small... and now it's gone. And yet we know that it goes on much further, to a time long, long ago, before there were any people and when our mountains didn't look as they do today. Some of them were bigger, but as the rain poured down it slowly turned them into hills. Others weren't there at all. They grew up gradually, out of the sea, over millions and millions of years. But even before the mountains there were animals, quite different from those of today. They were huge and looked rather like dragons. And how do we know that? We sometimes find their bones, deep in the ground. When I was a schoolboy in Vienna I used to visit the Natural History Museum, where I loved to gaze at the great skeleton of a creature called a Diplodocus. An odd name, Diplodocus. But an even odder creature. It wouldn’t fit into a room at home -- or even two, for that matter. It was as tall as a very tall tree, and its tail was half as long as a football pitch. What a tremendous noise it must have made, as it munched its way through the primeval forest! But we still haven't reached the beginning. It all goes back much further -- thousands of millions of years. That's easy enough to say, but stop and think for a moment. Do you know how long one second is? It's as long as counting: one, two, three. And how about a thousand million seconds? That's thirty-two years! Now, try to imagine a thousand million years! At that time there were no large animals, just creatures like snails and worms. And before then there weren't even any plants. The whole earth was a 'formless void'. There was nothing. Not a tree, not a bush, not a blade of grass, not a flower, nothing green. Just barren desert rocks and the sea. An empty sea: no fish, no seashells, not even any seaweed. But if you listen to the waves, what do they say? 'Once upon a time...' Once the earth was perhaps no more than a swirling cloud of gas and dust, like those other, far bigger ones we can see today through our telescopes. For billions and trillions of years, without rocks, without water and without life, that swirling cloud of gas and dust made rings around the sun. And before that? Before that, not even the sun, our good old sun, was there. Only weird and amazing giant stars and smaller heavenly bodies, whirling among the gas clouds in an infinite, infinite universe. And if we also ask, 'And how exactly did that happen?' we will be asking about history. Not just a story, but our story, the story that we call the history of the world. Shall we begin? Reprinted with permission from 'A Little History of the World' by E. H. Gombrich (Yale University Press, 2005). English translation copyright © 2005 by Caroline Mustill.